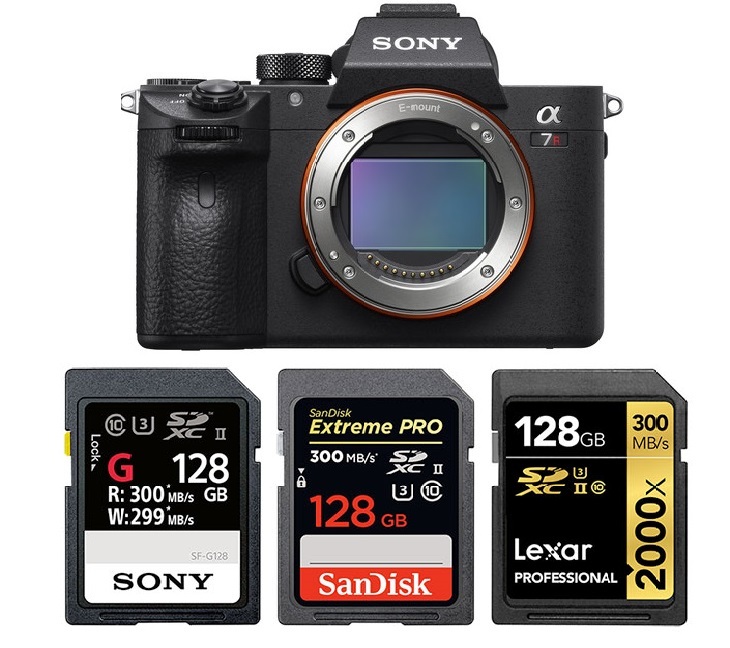 Here is our list of best memory cards for Sony a7R III mirrorless camera. The Sony a7R III ($3,198 at Amazon, B&H, Adorama) comes with 42MP BSI CMOS Sensor, 10 fps Shooting, UHD 4K video recording and two memory card slots. The card slot 1 supports ultra-fast UHS-II SD memory cards while the Card Slot 2 is compatible with UHS-I memory cards. As we all know, every second matters in photography, so a fast enough memory card is a must for serious photographers. And if you plan to shoot videos – the Write Speed matters – you will need a SD card that has minimum writing speeds fast enough to write the video without random pauses and stick to 64GB or 128GB (or larger) SDXC cards for the best video codex. Here are the top recommended SD memory cards for Sony a7R III mirrorless camera. Sony SF-G UHS-II Cards are currently the world’s fastest SD memory cards boasting an ultra-fast maximum read speeds of up to 300 MB/s and maximum write speeds of up to 299 MB/s and it is well-suited for video capture. Sony 128GB SF-G Series UHS-II SDXC: at Amazon, B&H, Adorama. Sony 64GB SF-G Series UHS-II SDXC: at Amazon, B&H, Adorama. Sony 32GB SF-G Series UHS-II SDHC: at Amazon, B&H, Adorama. Available in 32GB, 64GB & 128GB, the SanDisk Extreme PRO UHS-II cards offer the next fastest option: maximum read speeds of up to 300 MB/s and maximum write speeds of up to 260 MB/s. Stick to 64GB or 128GB SDXC cards for the best video codex. SanDisk 128GB Extreme PRO UHS-II SDXC: at Amazon, B&H, Adorama. SanDisk 64GB Extreme PRO UHS-II SDXC: at Amazon, B&H, Adorama. SanDisk 32GB Extreme PRO UHS-II SDHC: at Amazon, B&H, Adorama. With better construction and a lower price, the Hoodman Steel 2000x SDXC UHS-II features a read speed of up to 300 MB/s and a write speed of up to 260 MB/s. Hoodman 128GB Steel 2000x SDXC UHS-II: at Amazon, B&H, Adorama. Hoodman 64GB Steel 2000x SDXC UHS-II: at Amazon, B&H. With the same max read and write speed as the SanDisk Extreme PRO UHS-II SDXC card, the Lexar Professional 2000x UHS-II SDXC card is one of the best selling UHS-II SD cards, but it is already discontinued. Lexar Professional 2000x UHS-II SDXC with SD UHS-II Reader: at Amazon, B&H, Adorama. The Sony a7R III Card Slot 2 is compatible with UHS-I memory cards. The Sony UHS-I SDXC Memory Card (Class 10/U3) and SanDisk Extreme PRO UHS-I SDXC Memory Card (V30) are both excellent options with the same up to 95 MB/s read speed and 90 MB/s write speed in addition to capturing 4K video. Sony 128GB UHS-I SDXC (Class 10/U3): at Amazon, B&H, Adorama. Sony 64GB UHS-I SDXC (Class 10/U3): at Amazon, B&H, Adorama. Sony 32GB UHS-I SDHC (Class 10/U3): at Amazon, B&H. SanDisk 256GB Extreme PRO UHS-I SDXC (V30): at Amazon, B&H, Adorama. SanDisk 128GB Extreme PRO UHS-I SDXC (V30): at Amazon, B&H, Adorama. Sony a7R III store links: $3,198 at Amazon, B&H, Adorama. Read more: Best Lenses for Sony a7R III.